Sony Ericsson FH concept is designed by Doo Joon. The device is designed to perform the functions of three devices: phone, tablet and radio. 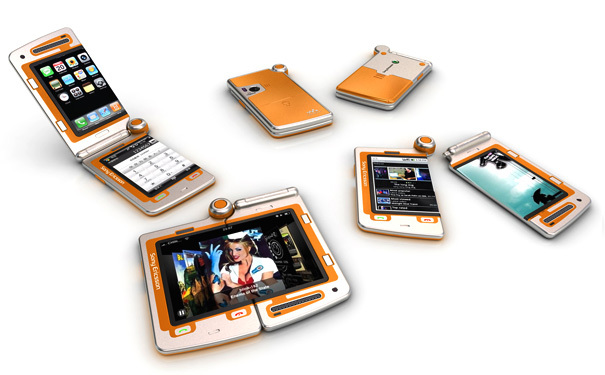 Sony Ericsson FH mobile concept is amazing planned ever by any mobile companies. This mobile phone designed well and looks gorgeous.This concept phone definitely looks amazing and appealing and mobile phone useres will get impressed upon seeing its photos. But beyond its stylish looks and amazing design concept. The Sony Ericsson FH is the world’s first dual flip phone that pivot both vertically and horizontally. SE FH equipped with two touchscreen portions which have equal thickness.Flipping it vertically makes it like a regular flip phone and the bottom touchscreen acts as a numeric keypad.It can be used as a standard clamshell style handset with the lower of the two displays acting as a number pad, or can be rotated down to make a pair of screens snap into one snazzy widescreen panel.It also includes an on-board camera with flash, and music playing features courtesy of Sony’s Walkman branding. Jun describes the idea as making it “more comfortable” to watch TV in the web browser, which couples with the user interface images to suggest that the device would run Android 2.2 mobile phone operating system.